I'm penciling in my eyebrows when the smog alert siren starts blaring. It’s happened every day since summer vacation started, so it’s no surprise. “May I have your attention,” this woman’s voice drawls over a loudspeaker. “An air pollution advisory has just been issued,” and the siren continues to drone on, like some kindly old dinosaur groaning away. Most of these advisories happen in the morning, usually just as I’m about to leave for cram school. Nobody does anything because of them. Everyone kind of goes, Oh, that again. What I’d like to know is where they hide those speakers. To me, that’s creepier and weirder than anything about smog. 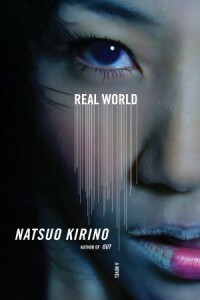 I picked up Real World by Natsuo Kirino on a whim, never having read anything by her before. This book intrigued me, but also left me very perplexed. In a crowded residential suburb on the outskirts of Tokyo, four teenage girls indifferently wade their way through a hot, smoggy summer and endless “cram school” sessions meant to ensure entry into good colleges. There’s Toshi, the dependable one; Terauchi, the great student; Yuzan, the sad one, grieving over the death of her mother—and trying to hide her sexual orientation from her friends; and Kirarin, the sweet one, whose late nights and reckless behavior remain a secret from those around her. When Toshi’s next-door neighbor is found brutally murdered, the girls suspect the killer is the neighbor’s son, a high school boy they nickname Worm. But when he flees, taking Toshi’s bike and cell phone with him, the four girls get caught up in a tempest of dangers—dangers they never could have even imagined—that rises from within them as well as from the world around them. I have very mixed feelings about this book. I liked the beginning, very promising; didn't like very much the central part; and somewhat liked the ending, even though it is so tragic. Anyway, this book might be titled Real World, but it felt very surreal to me. Why do the girls decide to help Worm, instead of turning him in? I mean, he has murdered his own mother, for God's sake! This remains the greatest mystery in the book, in my opinion. Overall, I'd say this book was very well done. Each chapter is told from a different character's point of view, which enables the reader to get different perspectives and see in the minds of the protagonists. I found the narrating voices very real and believable, even though the events weren't.